Understanding the aroma and taste of terpenes can make you a true cannasseur. Pinpoint the strain through terpenes to address specific conditions. Then pair them with food with similar naturally occurring terpenes. MYRCENE – This terpene is the most common in cannabis. Myrcene’s chemical composition allows its effects to kick in faster than other terpenes. The presence of .5 percent myrcene or higher points to sedating effects. Myrcene causes “couch lock,” the desire to stay put, relax and chill. Caryophyllene One of the hardest terpenes to pronounce, caryophyllene (car- ee-o-fil-lene) has a wonderfully spicy, woodsy, peppery profile. It’s also valued for improving overall mood. Some research suggests it can also boost metabolism. LINALOOL – This terpene has notes of spice and citrus, but the most prominent aroma is lavender. Linalool is the base oil for commercial fragrances, including perfumes and deodorants. Linalool-heavy strains can provide more mellow, sedating relief than limonene. Pinene Considered one of the most significant terpenes, pinene is found in over 200 cannabis strains. It is present in several herbs, such as rosemary, basil, dill and parsley. Pinene is credited with increasing clarity and focus, improving memory, increasing lung capacity, and mitigating the discomfort of too much THC. This terpene has two varieties: alpha produces the scent of pine and rosemary, while the less pungent beta offers aromas of dill and parsley. HUMULENE – Naturally occurring in hops, clove, basil and, of course, cannabis, this terpene has an unusual characteristic. Humulene is what gives beer its “hoppy” taste. Rather than being an appetite enhancer, humulene, like THCV, is an appetite-suppressant. LIMONENE – With a heavy citrus aroma, limonene has properties that work in concert with other terpenes and cannabinoids by improving their absorption through the skin, mucus membranes and the digestive system. This terpene naturally enhancer mood and relieves stress. It purportedly attacks and impedes the spread of cancer cells as well as aids in the regeneration of cells. BISABOLOL – Like linalool, this terpene is often used in skin care products. Its unique properties work to soothe and protect the skin against harmful environmental irritants. Bisabolol is responsible for all the soothing effects of chamomile. 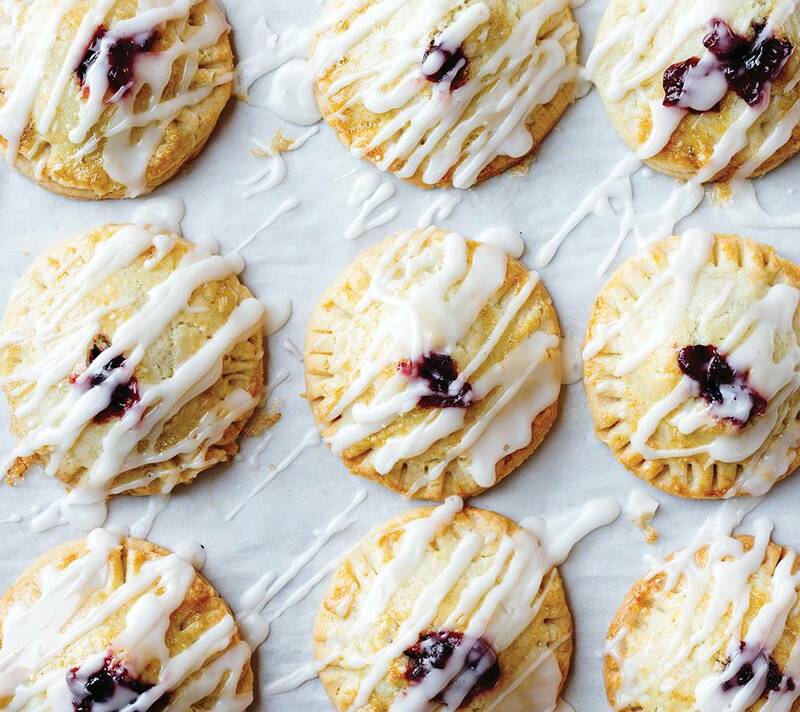 Tap on these infused cherry cookie hand pies, which have the naturally occurring bisabolol terpene, for the recipe. Just as you become familiar with weed vernacular, another term starts changing the conversation. Terpenes. They’re found in food and cannabis. But in weed, they’re becoming the driving force for choosing strains that address specific ailments. Depressed? Pick the strain that’s high in the terpene limonene. Got a pain in the neck? Look for the most myrcene. “Consumers are interested in specific effects from their cannabis, and terpene data helps them make more informed decisions,” says Eric Wendt, chief science officer at Green Leaf Lab in Portland, Oregon. Terpene testing, he says, has increased 200 percent over the past year. Found in the plant’s resin, terpenes are responsible for a strain’s distinctive scent and its associated effects on a wide range of problems. Scientists are learning that terpenes work in tandem with the cannabinoids, the components in weed that get all the credit for relieving anxiety, pain, seizures and a slew of other ailments. Researchers call it the “entourage effect.” In the past, conventional wisdom for choosing a strain rested on whether it was classified as a sativa (uplifting), indica (sedating) or a hybrid. Today, that thinking has lost its legitimacy. Instead, laboratories and cannabis dispensaries are now often equipped with cannabinoid and terpene profiles for various strains to narrow the choice that will work best for your purpose. A good budtender should be up on terpenes to help with your selections. For a primer on terpenes, check out page 93 in Volume 2 Issue 2 of Kitchen Toke.